*** This is the 2016 version of Muscle Premium. It is exclusively for institutions that purchased a perpetual license to this product and for promotional purposes. 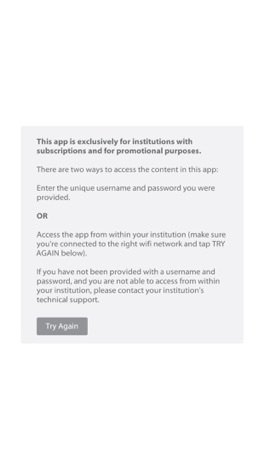 *** There are two ways to access the content in this app: Enter the unique username and password you were provided OR access the app from within your institution (make sure you're connected to the right wifi network). *** Usernames and passwords are not sold separately through Visible Body or available for purchase within this app. *** If you have not been given a username and password or if your institution has not subscribed, this app will be locked and unusable. *** There is a version of this app that does not require a username and password or subscription. To find and download it, search for Muscle Premium by Visible Body. 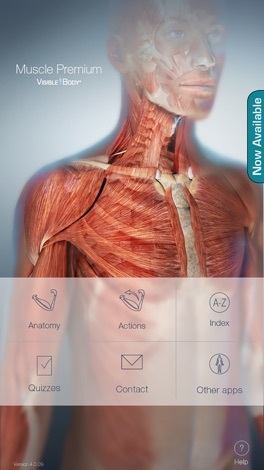 ***** Muscle Premium includes true 3D models of hundreds of muscles, bones, ligaments, bursa and nerves. Rotate, zoom into, and dissect to create ideal views of body regions. ***** Muscle attachments are visually depicted using paint on bones and pins on muscles. Common muscle actions are recreated in moving 3D models that you can zoom into and rotate. Pronunciations and detailed definitions describe origins, insertions, innervation, blood supply, and actions. Hundreds of quiz questions facilitate quick study and review. ***** Works on iPad 2 or newer, iPad mini, iPhone 4 or newer, and iPod touch (5th generation). Compatible with iOS 6 and iOS 7.